Competition fuel filters are manufactured from billet aluminum and are designed for high volume fuel systems. Utilizing a 40-micron disc element these filters are offered in -06 AN, -08 AN and 3/8'' NPT male outlets. 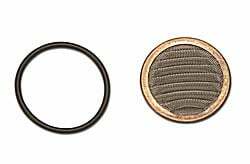 Competition filters are compatible with alcohol and disassembles for quick servicing of element. 651670 is rated 5.0 out of 5 by 1. Rated 5 out of 5 by Tom z from Good fuel filter I used the Russell fuel filter to replace the edelbrock in line filter. Worked fine.